Treat extremely dry hair to the KARITÉ NUTRI Intense Nourishing Shampoo from René Furterer. 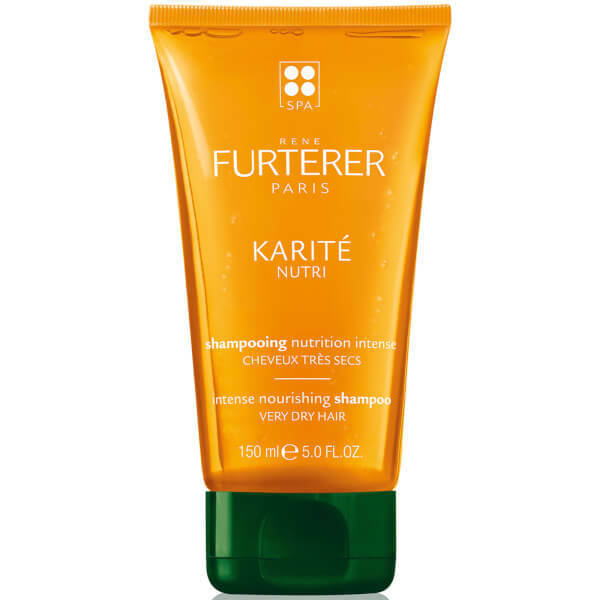 Fortified with a gentle cleansing base, the lightweight shampoo effectively rejuvenates and softens hair from root to tip. Harnessing the powers of Soya-derived Cimentrio, Wheat Microproteins and ethically sourced Shea Butter, the rich, regenerating shampoo works to revive and renew damaged hair, whilst soothing and restoring comfort to the scalp. Expect supple, healthy-looking hair that is easier to manage. Apply to scalp, lather, then rinse. Reapply, leave in for 2 minutes, and rinse thoroughly. Use 1-2 times per week. Water (Aqua), Sodium Laureth Sulfate, Peg-7 Glyceryl Cocoate, Oleth-10, Lauryl Betaine, Decyl Glucoside, Butyrospermum Parkii (Shea) Oil (Butyrospermum Parkii Oil), Ascorbyl Palmitate, Benzyl Salicylate, Bht, Butyrospermum Parkii (Shea) Butter (Butyrospermum Parkii Butter), Ceteareth-60 Myristyl Glycol, Cetearyl Alcohol, Citric Acid, Coco-Glucoside, Fragrance (Parfum), Glyceryl Oleate, Glycine Soja (Soybean) Oil (Glycine Soja Oil), Glycine Soja (Soybean) Sterols (Glycine Soja Sterols), Glycolipids, Hexyl Cinnamal, Hydrogenated Palm Glycerides Citrate, Hydrolyzed Wheat Protein, Hydroxycitronellal, Hydroxypropyl Guar Hydroxypropyltrimonium Chloride, Lecithin, Limonene, Linalool, Phenoxyethanol, Phospholipids, Polyquaternium-10, Sodium Benzoate, Sodium Chloride, Sorbic Acid, Tocopherol, Yellow 5 (Ci 19140), Yellow 6 (Ci 15985).